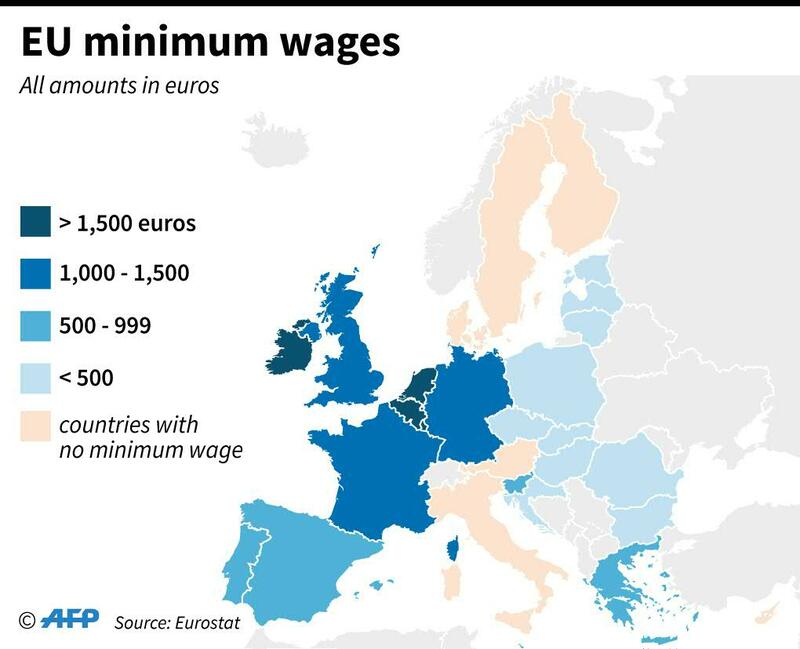 Paris – Twenty-two out of 28 EU states have introduced a minimum wage, trumpeted as a key pillar in the construction of a social Europe. But huge disparities from one country to the next are fuelling resistance from opponents who see the policy as dragging down competitiveness, sovereignty as well as levelling down salaries. Brexit, as an expression of eurosceptic populism, has jolted the European Commission into going on the offensive as it looks to show the European Union is not just a common market but a bloc with a social dimension. A November 17 Social Summit for Fair Jobs and Growth last year in the Swedish city of Gothenburg set the ball rolling as all 28 EU members signed up to a Europe-wide charter on social rights, laying down 20 basic principles including statutory minimum wages as a mainstay of a policy framework to boost convergence. “Adequate minimum wages shall be ensured, in a way that provide for the satisfaction of the needs of the worker and his/her family in the light of national economic and social conditions, whilst safeguarding access to employment and incentives to seek work,” according to the guidelines. But the non-binding declaration is, as such, merely symbolic, not least because “European treaties stipulate clearly that salaries come under the national purview,” notes Claire Dheret, head of employment and social Europe at the Brussels-based European Policy Centre (EPC). To date, the Gothenburg charter is being respected only partially, even if all but six EU states have a legal minimum wage, as witnessed by Eurostat data highlighting starkly varying levels from Bulgaria’s 460 leva (235 euros; $270) a month gross to 1,999 euros in Luxembourg, that is, nine times as much. Even so, the discrepancy does shrink to around a factor of three when the cost of living in each state is taken into account. But the Eurostat data shows up major discrepancies between eastern and western states. Ten of the former pay a minimum of less than 500 euros, whereas seven western EU members have set rates surpassing 1,300 euros. Five southern states pay between 650 and 850 euros. The six without an official minimum, which have their own arrangements to cover the basic needs of low earners are Austria, Cyprus, Denmark, Finland, Italy and Sweden. Despite the steep discrepancies, the thrust of the debate is the same in most countries, with bosses often finding the minimum too high while unions demand increases. Luxembourg unions want a 10 percent increase, saying the current level, although the bloc’s highest, is not enough to live on in the Duchy where a one-bedroom apartment rental can easily eat up around two thirds of the sum. 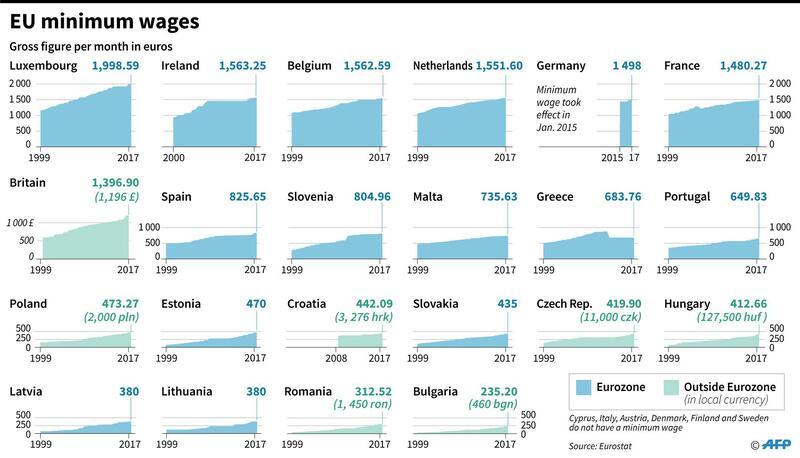 Bosses retort that such an increase “would risk destroying the weakest firms” in the words of Jean-Jacques Rommes, president of the Luxembourg Enterprise Union (UEL) by hiking wage bills. In Romania, where the minimum wage doubled between 2013 and 2017 from 700 to 1,450 lei (157 to 319 euros), “employers often ended up cutting jobs or opting to pay people under the table,” says Dan Popa, an economist. With the most recent rise on January 1, 60 percent of employers that Romania’s federation of bosses sounded out feared layoffs would be unavoidable. Cash-strapped Greece, in contrast, saw its minimum wage slide from 877 to 684 euros in 2012 with Alexis Tsipras’s government unable to fulfil a pledge to increase it. Bosses were resolute in saying a rise would hit labour market “flexibility”. 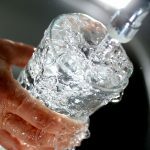 Britain’s independent Institute for Fiscal Studies (IFS) estimates that more and more workers face losing their jobs if a “national living wage” for workers over 25 is increased in April from its current £7.83 (8.90 euros/$11) per hour gross, equating to around 1,510 euros a month in a country where the official jobless rate hit a four-decade low of 4.3 percent in the third quarter of last year. In Germany, before the minimum wage started in 2015, rightwing parties and some economists warned of resulting mass layoffs — the IFO economic research institute predicting up to 900,000 jobs coming under threat. The minimum is currently set at 1,498 euros a month and “up to now we see no negative effect on employment,” says Dirk Schumacher, an economist with Natixis in Frankfurt. But he adds there has been no discernible effect on reducing poverty either. A 2016 study by the IAB institute for employment research put at 60,000 the number of posts either lost or else not created owing to Germany’s minimum wage. The study found that the country had seen a net 436,000 jobs created from 2014. Among those countries without a minimum wage is Italy, where professional guidelines determine pay levels although there has been discussion on introducing a formal minimum. A 2014 Jobs Act to reform the labour market under then centre-left prime minister Matteo Renzi included scope to create one — but the idea was ultimately shelved. It is not the EU’s intention to push for a minimum level across the board — indeed Commission President Jean-Claude Juncker said last year it would not be a logical step given differing labour market conditions. Analyst Claire Dheret noted that widely differing purchasing power across the bloc effectively ruled out a uniform rate. “All credible proposals which have been made up until now are rather (based on) a percentage of median salary, which could vary from 50 to 60 percent,” says Dheret, taking up an idea favoured notably by Luxembourg. Trying to avoid social dumping is one argument in favour of a statutory minimum — but a mechanism basing it on salaries on a country by country basis would not, in the short term at least, overcome the issue of intra-bloc differentials. The minimum in France currently stands at around 1,500 euros. Many of the minimum salary’s detractors hail from eastern Europe, with labour ministries notably in the Czech Republic and Poland voicing opposition: Prague on the grounds of widely differing levels of economic development and Warsaw saying it was an issue for national governments. The 2013-2017 Czech government led by the Social Democrats and also comprising the populist ANO and the small centrist Christian Democrats raised the minimum wage four times up to 40.5 percent of the average wage amid low unemployment and strong growth. “The increase in the minimum wage reflects the current favourable economic developments,” then prime minister Bohuslav Sobotka said. But after he was replaced in December by ANO chairman and billionaire Andrej Babis, the new government only said it would “draft binding rules for predictable growth in minimum wages” while ruling out promoting a European minimum for now. Popa says it would be very difficult for Bucharest to introduce “as the difference between the Romanian minimum wage and the EU average is very large,” even if the former is more than half of mean wages. Dheret sees some of the eastern states’ opposition as based not just on their relative lack of competitiveness but also “resistance to the EU being able to deal with such issues. It’s a bit of a culture clash”. Dheret further notes that Nordic countries, most of which do not have a statutory minimum, are also somewhat “chilly” on the idea of pan-European legislation on the issue. In Sweden, a country enjoying some of the continent’s highest salaries, there is general consensus that the subject should be dealt with according to the country’s traditions whereby companies and unions reach wage accords based largely on an employee’s age and experience. One Swedish diplomatic source maintains this system aids “equilibrium” in the labour market and fears that harmonisation could drive down incomes.